...and what does December 21, 2012 have to do with it all? Click on the book covers to see an overview of their chapter contents. Read them online or download them for free! Bible prophecies sealed for 2,000 years! My two books present God’s message of hope to humanity and Israel. They also present a warning to all who reject that message! The ancient calendars of the Mayans, Aztecs, Chinese and Hebrews intersect on 21 December 2012. Why? Discover how these ancient records with links to before Noah's Flood hold vital clues to the future of our earth. Theology failed to unlock these mysteries, but science does. Read the startling insights of hi-tech inventor Herbert R. Stollorz as he reads the Bible through the eyes of an applied scientist. Prove it for yourself. There is no need to buy anything to do so. Only time will convincingly demonstrate whether these books reveal the discovery of the century or not. Meanwhile, a few highly educated and successful people have referred to my books as, “a breath of fresh air.” An Arabic scholar of the highest degree stated to me “it is the best ever to come out of the West.” So that’s why I spent the time and money to translate and publish my books for you to read. How is it possible to Date the Apocalypse? Why will there be an Apocalypse? Will New York City be destroyed early in 2009 by whom? 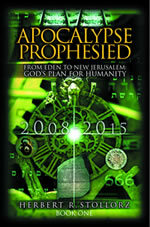 Click here to buy Apocalypse Prophesied! Click here to buy Mystery of Tammuz 17! What does the Bible and science tell us about God? Why did He create humans? Why will a loving God judge all nations with seven years of severe trials and tribulation leaving only about 10-20% alive at the end? What is the purpose for the Apocalypse? Why does it begin in heaven? What are angels? Can angels die? How does Noah’s Flood help to date the Apocalypse? How might society’s greedy exploitation of nature through genetic manipulation cause the Apocalypse to start even sooner? What makes Antichrist so different from all the previous world conquerors? Why is he so evil? What does number 666 mean? How will Jesus’ coming 1,000 year government be structured so that true peace and justice finally becomes reality for all peoples? What happens when people die? What will hell be like? What will happen to Israel and the church during the Apocalypse? Why? How do you know that the Apocalypse will begin on December 21, 2008? Why are you so sure? How does 12 December 2012 link the Aztec, Chinese and Hebrew calendars? Can God change his schedule to make it start sooner or later? What has the jubilee (50) year gear between 1968 and 2018 got to do with the Bible’s Rosetta stone and Daniel’s 70 Weeks prophecy? How and when is the spirit world revealed to mortals? What are Antichrist’s “Shock Troops”? Will mortal believers go through these trials? How does the Hebrew Alphabet Number System unlock and confirm God’s ancient schedule for history and prophecy? Why is it important to read both testaments of the Bible? "On my web site you will find the answers to these questions and many others. I use a scientific methodology - not a theological one!